Any clinic can develop these three skills, and I’m sure that they’ll see their GCR Score rise steadily over time. And any clinic can get even more out of the above 3 points by mastering the “thank you,” that they give to patients, or by understanding how things like tone and word choice make an enormous difference in support for patients, especially when things go wrong with your patients, a topic which I’ll cover in another article for the GCR. However, many clinics officially rated by the GCR tell me that delighting patients isn’t so straightforward – what actually works doesn’t always reflect what most of us would assume. There are quite a few counter-intuitive truths that can make or break how your patients feel about how your clinic provides support to them. Below are 4 surprising data points on what patients really expect out of “good” support from your clinic. Conventional wisdom would suggest that the faster a patient gets help, the happier they’ll be. And in general, that’s true. However, there are other, often-overlooked elements that are even more important than speed. The GCR has measured how satisfied potential patients felt after getting sending an email to their chosen clinic with a particular dentistry problem. While patients who felt that the clinic offered speedy support were six times more likely to choose the clinic for their treatment, patients who gave the clinic high ratings on “personal” factors (like the teams’ courtesy and willingness to help) were nine times more likely to choose the clinic. Speed is one factor, but it is markedly less important than having team members at your clinic who can deliver support in a friendly and competent manner. Rather than a laser focus on speed, try emphasizing thorough, attentive, and friendly patient support. 2) … Except on social media, where speed matters most. Patient expectations – the expectations that patient happiness hinges on – change based on the medium you’re interacting with. While speed may not be most important for email, phone, or in-person support, in social media, speed trumps all. In a survey by the GCR, 32% of potential patients who contacted their chosen clinic via social media expected a response within 30 minutes, and 42% expected a response within 60 minutes. And patients don’t like to wait just because it’s a night or weekend. 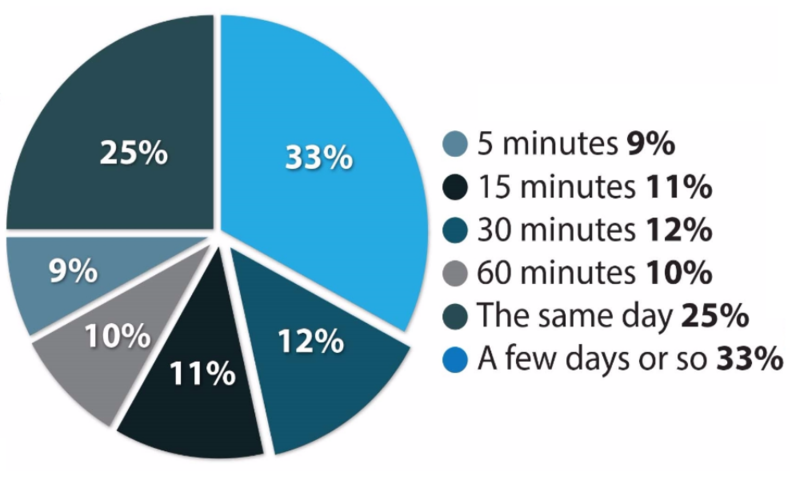 57% of patients expect the same response time at night and on weekends as during normal clinic hours. 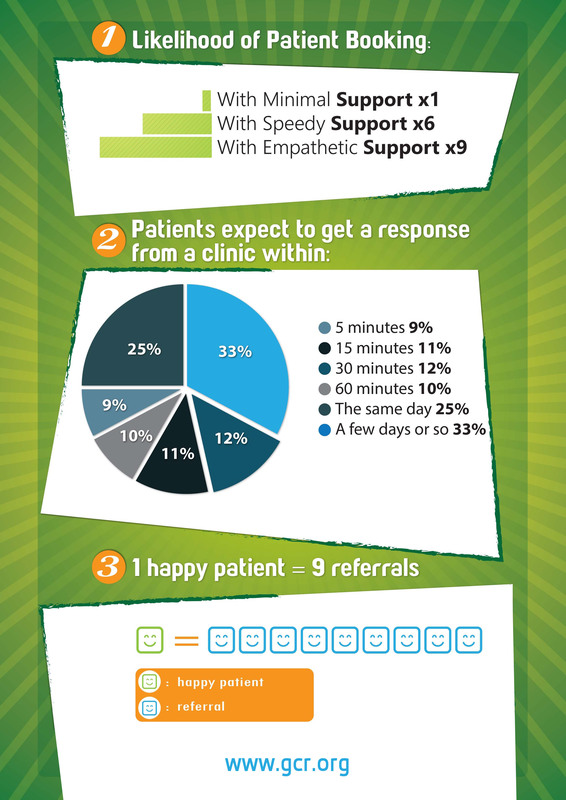 It might not be fair, but it’s a fact: patients expect speedy support from clinics on social media. When I speak at healthcare events and meet clinic owners, I cover many ways to delight your patients. 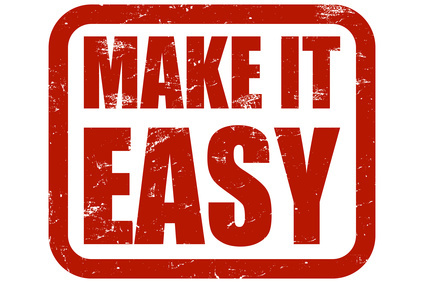 It’s a great habit to get into, and it can be a great way to grow your clinics GCR Score. But delighting your patients doesn’t mean you should just be extra nice to them. There’s another powerful way you can develop loyal patients: reduce their effort. The GCR has surveyed patients about their phone, chat, and email interactions with support representatives at various clinics. The study found that the single most important factor in helping a patient choose your clinic is reducing the amount of work the patient has to do to get their problem solved. Simple: If the patient needs to do something to resolve their issue, do it for them. Does your patient need to visit your website to learn more about the medical procedure or fill out a form to make updates to their information? Make the updates for them. Send them the exact link to the material. Call them later to check they’ve understood it. Do they need to take steps to troubleshoot an medical problem that they’re having? Send them a video, have them send you a photograph of the problem, set up an appointment at a referral clinic for them. Does it appear difficult for the patient to travel your clinic? Send them an online map from their current address to your clinic detailing train, taxi, bus and petrol costs using https://www.google.sk/maps or another tool – or even send them a chauffeur / taxi to pick them up – I’ve seen some clinics do this with great results. By taking the work off of your patients’ plates, you can both reduce their effort and delight them, as they’ll be more than a little bit surprised by your (unfortunately) unusual approach to dealing with patients. * Bonus: What’s the biggest reason patients choose a new clinic? Yes, those can all take patients away from you. But, according to the GCR patient Experience Report, the biggest reason people leave a clinic for another one is due to a poor patient support experience. In fact, 82% of people have left a clinic or doctors practice because of a bad patient support experience. On the other hand, creating good patient experiences and happy patients delivers a big — and predictable — return on investment: Happy patients, on average, tell nine people about their experiences. So while bad patient support can crush your clinic and GCR Score, delivering excellent patient support can help build loyal patient relationships, reduce churn, increase retention and referrals, build your GCR Score and quickly grow your clinic.